Techiyogiz has reported that BSNL has launched ‘Swadeshi Samriddhi’ SIM cards in partnership with Baba Ramdev’s Patanjali. 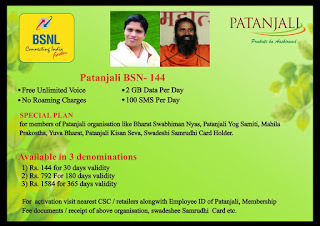 BSNL-Patanjali SIM Cards mentioned below. These SIM Cards comes in three plans in total featuring 2GB data per day, unlimited voice calls, 100 SMS per day and no roaming charges — all with different validity periods. Rs 144 plan comes with a validity of 30 days, the Rs 792 plan comes with a validity of 180 days and the Rs 1,584 plan comes with a validity of 365 days. Special Plans for Baba Ramdev’s Patanjali company, as well as employees of associated organisations such Bharat Swabhiman Nyas, Patanjali Yog Samti, Mahila Prakostha, Yuva Bharat, Patanjali Kisan Seva, and Swadeshi Samriddhi card holders. Ramdev said that the government-owned BSNL is a ‘Swadeshi network’ and the motive of both Patanjali and BSNL is “welfare of the country”. Talking about the company’s motive “prosperity for charity”, he further said that in addition to attractive data and call package, the card also comes with the medical and life insurance covers of Rs 2.5 lakh and Rs 5 lakh, respectively.